Luckily there's a section of covered porch here overlooking the water, so rain or no rain, I'm curling up with a stack of books this week. Despite my hopes of focusing on backlist on vacation, deadlines loom, so I'm picking up a few upcoming releases (My Year of Running Dangerously and 2015 Best American Science Fiction & Fantasy). I'm also eying the new Margaret Atwood book, because NEW MARGARET ATWOOD BOOK (I'll count this for my book written by an author over the age of 65 in the Read Harder challenge) and finally getting to What I Talk About When I Talk About Running, which has been on my list for what feels like years. 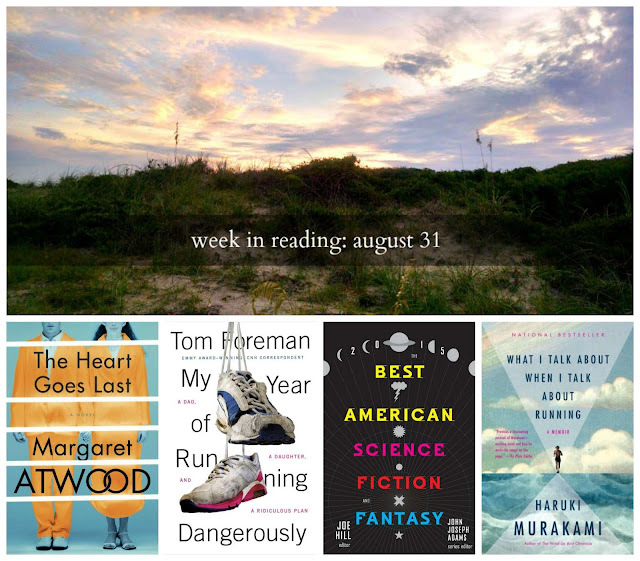 What are you all reading this first week of September?